Alter Eco: Support us with edible credits. 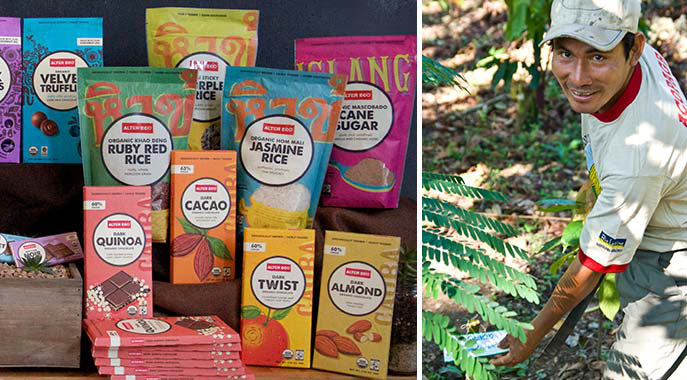 Alter Eco is a values-based brand of specialty food products that creates sustainable, delicious, exotic, and healthy ingredients from around the world for people to enjoy, while directly benefiting farming communities in the Global South. By working directly with the small-scale farmers who grow our quinoa, rice, sugar and chocolate, helping them institute Fair Trade and Organic practices and assisting them in improving both quality of food and quality of life, we’re creating a system that benefits everyone involved. Since the beginning, Alter Eco has incorporated environmental sustainability into the three main pillars of the entire brand. We truly believe it’s possible to have wholesome food that is not just good tasting and good for you but good for our community of producers and for the planet. We work closely with our global farmer communities to integrate environmental responsibility into the core foundations of our relationship. We strive to not only have a zero carbon footprint, but to continually give back to the planet. At the register, use the Credibles app on your smartphone to redeem your credits for Alter Eco.